Branson is home to numerous Southern Gospel concerts throughout the year. Praisefest at the Mansion Theatre is back for the 2018 season. The lineup is incredible for this 3-day event! Praisefest begins on Thursday, March 15 with an evening concert featuring: Mark Trammell Quartet, Legacy Five, Greater Vision, and comedian, Tim Lovelace. The first morning session begins Friday and opens with The Ball Brothers, Southern Raised, and Greater Vision. Dr. David Jeremiah will also be sharing a message from God’s Word. Friday evening is another incredible session. The Collingsworth Family, Freedom Singers, and Legacy Five will all be in attendance. Tim Lovelace will also be back making the audience laugh! Saturday morning may be the last session, but it will be just as exciting as the others! Saturday morning will feature Triumphant Quartet, the Booth Brothers, TaRanda Greene, and Tim Lovelace. 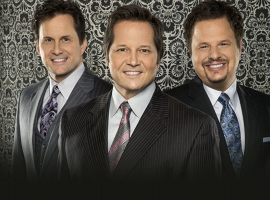 This event is a great way to see all of your favorite Southern Gospel artists in one place. It will be a great time of music, fellowship, and worship!